Wouldn’t it be great if you could buy time? Imagine being able to stroll into Tesco Express and pick up a jar – or a tube or a roll – of time, just to tide you over when things got a bit busy. Sadly, buying time isn’t yet possible (we’re sure someone somewhere is working on it). But saving time, now that is possible. Not in a piggy bank, of course. You have to use it in the same sort of linear fashion as everyone else… oh, you know what we mean! Anyway, here are our top tips for saving time at work. You may be very proud of your ability to write an email while having a Skype call, eating a donut and tidying your stationery drawer, but it’s not doing you any favours when it comes to efficiency. Studies have shown that batch tasking – doing a series of similar tasks consecutively – is a much better way to get stuff done, so block out your time, get your head down and power through. Did you read our recent post about New Year’s resolutions every business owner should make? If so, you’ll know that the fact that our electronic devices are so keen to tell us what’s going on means we can spend our entire lives fielding notifications. 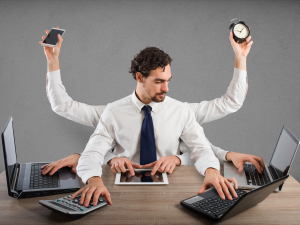 If you’re going to stop multitasking, you’ll need to make sure that you’re not getting interrupted every five seconds by a ping from Facebook, LinkedIn or your email. How many hours have you spent scrabbling around in the archive room looking for paperwork you can’t even remember seeing, let alone filing? Wouldn’t it be so much easier if you could get hold of it at the touch of a button? Going digital by using a document scanning service (ahem, like ours) is a huge time saver, plus you’ll save on storage space too, so it’s a double win. This isn’t a joke, promise. No one likes standing up for too long, right? So by banning chairs from your meetings you’ll reduce unnecessary chitter chatter, and everyone will get straight to the point. Result? Shorter meetings and more time for you to get on with other stuff. Without getting too science professor on you, there are these things called Circadian Rhythms, which basically control how we feel and behave within a 24 hour period. Listen to your body, work out when you’re most productive – maybe first thing in the morning or just after lunch – and try to do your most complex work then. You’ll zoom through it much faster than if you try when you’re feeling sluggish and no use for anything except drinking tea and possibly doing a gentle Sudoku. Do you really have to do everything on your to do list yourself? Is there someone else who can do some of it? Someone who, dare we say it, can do it quicker and even (gasp) better? Play to your strengths. If that means hiring in outside help – be it someone to handle your blogging or your event planning – you’ll probably find that the cost savings associated with you freeing up your own time will cover it. Speaking of outsourcing… Did you know that the average business person working 40 hours a week spends 22 minutes a day sorting out computer issues? That’s 88 hours a year! Just think what you could do with that time if you had a dedicated techie to work out why all your emails since August have disappeared, rather than trying to do it yourself. Of course, the very simplest way to save time is to be really, really stingy about how you spend it. Get into the habit of saying, “I’ll just check my schedule” when people ask if you can do something or invite you to an event. That way, you don’t have to say no to their face and you can work out a really great excuse if you don’t want to accept. Good luck, and if there’s anything we can do to help (hint: number 3 is a bit of a specialism of ours) then do get in touch. Have you ever thought about whether choosing local businesses as suppliers can benefit your own business? There’s something about the start of a new year that makes us a little bit philosophical. Perhaps it’s the feeling of new beginnings, that sense of starting afresh with a blank slate, ready for the next 12 months of adventure. Or it could, admittedly, be too much Christmas pudding and sherry. Either way, the thing we’ve been mulling over recently is the whole question of multinational vs independent local business. Because as a local business ourselves, we’re really rather proud about how much small businesses contribute to the local economy. Over 99% of business in the UK are classed as small (in other words, with less than 49 staff) which is quite something when you think about it. 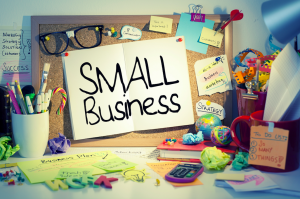 In fact, around 76% of businesses don’t employ anyone at all aside from the owner, which means that even the really tiny sole trader business are absolutely vital. Sadly the multinational conglomerates, with their endless pots of cash, can buy the kind of marketing that often overshadows the humble local business. Which is a shame, because we really believe there are some sound reasons why choosing a local business can actually be good for your own business. As a time-pushed business owner, you don’t want to be trekking up to London to meet your accountant or getting on a plane to sit down with your marketing agency, right? Being able to get face-to-face with your suppliers quickly and easily is definitely a bonus of choosing a local business. It’s also better for the environment, whether you’re looking at your own transport or that of any goods being shipped. And in the case of document storage – our particular passion, in case you’d missed that – it’s an awful lot easier to access your files quickly if they’re nearby in the South West rather than up north somewhere. There’s nothing like a local business community. So many small businesses live and die by referrals they get from people they’ve met at local networking events, exhibitions, conferences and the like. By choosing to work with other small, local businesses, you’ll almost certainly find your services being used in return. It’s a symbiotic relationship that can only be good for the economy and for everybody’s bottom line. Bigger doesn’t always mean better. Just because a company has fancy offices in London, New York and Singapore, doesn’t mean they’re actually going to produce work that’s of a better quality than Nearby & Sons down the road. Local businesses are often started by very passionate, very skilled people who genuinely want to help their clients and build something they can be proud of. There’s more accountability, more personal pride and often more attention to detail. And of course, there’s the feel good factor of knowing that you’re contributing to the local economy, and stopping the world descending into a bland monopoly of faceless corporations. You can’t really beat that, can you?